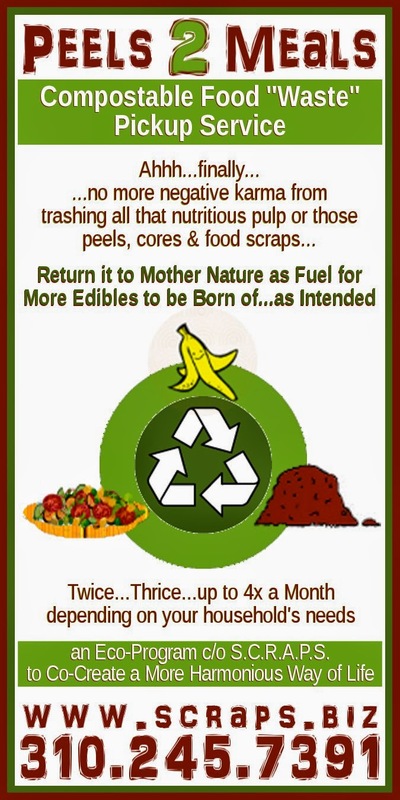 Do you have questions about composting? Stop by the Green Tent this Sunday! Heidi, our guest, is an expert. She'll have worms at the booth so kids and adults alike can stop by and connect with their vital and masterful Mother Earth tending wormships. Heidi is the founder of Peels2Meals, a compostables pickup service - taking compostables (peels, cores, pulp, food scraps, coffee grounds...) from your home to compost to gardens. Heidi's vision is the co-creation of a more and more and more eco-harmonious present-day way of life. Notice: Possible cancellation due to rain. Please check the weather before heading for the Green Tent this Sunday. If it's just a light sprinkle, we'll be there. If it's pouring, we'll reschedule Peels2Meals for a more Southern California-like day.